Ideally suited to wine processing plants and similar temperature critical processes, the new pneumatic valves are compact and quick and easy to install in both new and existing installations. 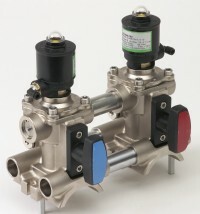 ASCO Numatics introduces the 290 Series of air operated valves for temperature control applications. Certified safe for use in wine production processes, the valves are ideally suited to installations in wine processing plants and similar temperature critical processes. The weld-free valves are available as single valve 2/2 modules for individual use, or two valve 2/2 modules for feed and return applications. The compact modular design removes the need for welding, making installation quick and easy in both existing and new installations. The 290 Series pneumatic valve is ideally suited to controlling the opening and closing of cold/hot water circuits through a heating/cooling coil in the vat to reduce or increase the fermentation of the wine. The compact units are only 60 per cent of the height of alternative valves, making them suitable for applications where space is restricted and, with a KV of 5.5 m3/hour (2.5m3/hour to 1.8 m/s), the valves are suitable for the thermal regulation of vats with capacities in the range 30 to 300 hectolitres. They are certified safe for use in wine production with no risk of contamination of the product from contact with the valve (French EXCELL Laboratory green label). 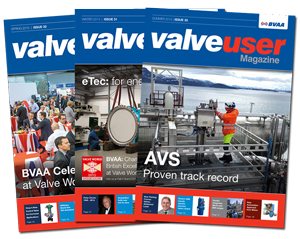 The valves feature a quick �plug & play� connection suitable for use with pipework or hoses with an overall diameter of 40 to 44mm or 50 to 54mm. 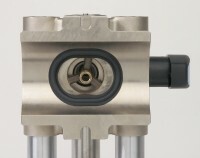 The valve clamps over a 20mm hole cut into the main hot and cold pipes providing a fast and reliable connection. 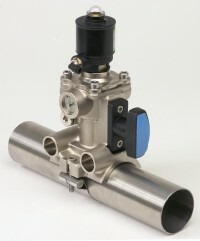 The valves feature a G� connection to the coil, an instant fit pneumatic connection for ease of installation, and an integrated 2/2 isolation valve for ease of maintenance. The valves are supplied with blue and red labels to indicate their use with hot or cold feeds. The 290 Series valves are suitable for mounting in any position without affecting operation. All valves in the range are available with the option of a manual drain to avoid internal freezing and an optical position indicator. The distance between the valves on the two valve modules can be specified by the customer − providing complete installation flexibility. The 290 Series of valves for fermentation temperature control are part of a much wider range of components for the control and automation of wine producing processes. These include solenoid valves and pneumatic components for use in wine presses for operations such as rinsing, door opening, valve control and door seal inflation. ASCO Numatics pneumatic valves are also ideally suited for applications in the automated processes used during filtering, treatment, bottling, labelling and packaging. There are also applications for solenoid valves and proportional valves to maintain the correct environment in wine cellars by ensuring that the humidity and temperature of the cellar is controlled to allow the barrels to �breathe� properly.